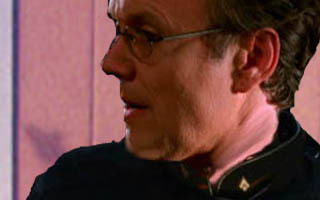 Giles held a data pad in hand, reviewing his appointment schedule, giving it one last look before the day began. A questioning look came over his face, and he set the pad down and moved to his computer. He activated his video-comm and punched in an extension. Within seconds, the image of a female executive assistant appeared. "Veronica Wyndham-Pryce, please," Giles requested. "I'm sorry, Mr. Chairman, but Ms. Wyndham-Price is unavailable," she informed him. Giles frowned. "Where is she?" he asked. "The prison hospital, sir," she replied matter-of-factly. "Visiting Mr. Rayne." "Yes, very well," Giles responded, a hint of exasperation in his voice. "Please tell her I called." "Yes, sir!" the assistant replied. Giles ended the call with a testy tap on the keypad. "It's as if the woman doesn't even have a job here anymore," he fumed to himself. "She's never around, she's always there, seeing…him." He sat up straight in his chair and assumed a haughty posture. "I'll tell you what…when she gets back, I'll give her a piece of my mind, that's what I'll do." A sudden beep from his desk jostled Giles from his annoyance. He turned in his chair and touched the answer button on his speaker. "Ms. Lance is here to see you sir," his assistant informed him. The chairman closed his eyes and swore under his breath. "Let her in," he said. There was music drifting out of Lex's lab in Red Sector – some thrumming beat that caused the capillaries in James's head to throb. He rubbed his thumbs over his temples as he stepped through the door. Lex stood at the far end of the shop, his back to James, rocking back and forth in time to the music. Anya was in the corner, frowning and snapping at a short, blonde woman. The few assistants clustered around Lex parted silently for James. He sighed and tapped Lex on the shoulder. Lex spun, smiling. "James! Hey, buddy, I thought you'd left already." Lex reached up and hit the corner of a panel on the wall. The music stopped. "Soon." James cast a look over his shoulder at Anya and asked quietly, "Any luck?" "Oh yeah, tons." James raised an eyebrow. Lex smiled. "And by tons, I mean some. Or rather, a bit. Perhaps even a smidgen." 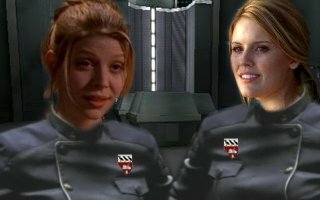 Lex led James to the lab's main computer terminal. He tapped a few keys, pulling up a series of files. James's eyes went wide before he pushed Lex aside and began to type. "Hey!" Lex made an indignant noise and tugged on James's sleeve. "No fiddling! I finally got the sequence to work, and I'm not cleaning up another one of your 'oopsies', all right?" James stepped back, holding his hands up in surrender. "Fine, fine." He glared at Lex, but a smile tugged at his lips. "But I'll have you know, I'm a genius. I've got a degree in fiddling." "Yeah, yeah. Tell it to my research team the next time you set them back a week because you 'just had a thing you wanted to try'." His voice pitched higher in what was in no way an accurate parody of James's tone. "Excuse me," came an annoyed voice. Lex and James turned to look at Anya. She was sitting on the edge of a table, clad uncharacteristically in a floral sundress. Were it not for the wires snaking out of her and the computer monitor showing a steady readout of her neural activity, she might have almost appeared human. She swung her bare feet beneath her in a childish fashion. "Excuse me," she repeated. "Isn't anybody going to ask how I'm feeling?" James smiled as he approached her. She held out her hand, and he clasped it warmly. "Sorry, Anya. How are you feeling today?" She grinned brightly. "Like sandpaper." Lex groaned and shook his head. James coughed to cover a laugh and smiled indulgently. "And how does sandpaper feel, Anya?" Anya giggled to herself then whispered, "Rough!" While Anya collapsed in giggles, James turned to glare at Lex. "I ask you to import some of Willowgram's personality pathways, and you choose bad jokes?" Lex shrugged, not bothering to hide his amusement. "Hey, it worked, didn't it? The groundwork is all laid out. We've unscrambled the pathways and filled in the missing bits, even if they're not really her bits. We'll be able to build her a personality base from there." James nodded, but he didn't look happy. Anya squeezed his hand and leaned forward to lay her head on his shoulder. He sighed. "I just wish we could recover more of her original programming. It doesn't seem fair to her to just write over who she was." A hand settled on James's shoulder, and he looked up at Lex. "Would you rather she stay like this forever?" Lex asked. "We've got a better shot at reconstructing her personality if we don't have to work from scratch. We can worry about recovering her memories later. You know, when she's not all crazy-like." James started to respond, but Anya suddenly sighed and whispered something against his shoulder. "Anya? Did you say something?" "On the right track," Anya murmured. James glanced down at her. "What?" Anya sat up with a clear, serious expression on her face. "You're on the right track. Don't give up, James." James blinked and half twisted toward Lex. His mouth worked for a moment, trying to speak and failing. But Lex was already at the monitor, taking note of the sudden spike in Anya's neural readout. "What do you mean, Anya? How are we on the right track? Do you know what we need to do?" James grabbed Anya firmly by the shoulders, forcing her to look at him. He stared into her eyes, a look of frantic worry on his face. Anya seemed ready to answer. She smiled at him. A genuine smile, full of friendship and understanding. Far different from the maniacal grins she'd been giving him lately. Then, as suddenly as it had appeared, the clarity in her eyes vanished. "I can't explain myself, I'm afraid, sir," she said in a strange, sing-song voice, "because I'm not myself you see." James blinked in confusion. He turned to Lex, but his friend only shrugged in response. James shook his head and regarded Anya sadly. "Every damn time." Stepping away from Anya, James ran a hand through his hair. He took a deep, calming breath. "Look, I've gotta go. They're expecting me at the hangar. I guess you can just turn her off while I'm gone. Maybe this trip is a good thing. It'll give me a chance to clear my head. Maybe come up with some new ideas." He looked up to see Lex looking at him with confusion. "What are you talking about, man? I'm going to keep working on her." James seemed slightly taken aback by that. "Oh. Well, you…you don't have to do that. I really appreciate your help, but I know you've got your own work to get back to –"
Lex waved a hand, cutting him off. "James, we're friends. I'll keep working." A look of such sheer relief and gratitude crossed over James's face that Lex turned away, scuffing his shoe against the table leg. Before James could say anything, Lex coughed and waved him away. "Well, get going already! Toni's a stickler for departure times. You don't wanna get left behind." "Right." James squeezed Anya's shoulder briefly, then hesitated before punching Lex lightly in the shoulder. Lex feigned injury and waved him off. James was smiling as he left the room. The amicable look on reporter Lisa Lance's face did little to ease Giles's frown of annoyance at her presence in his office. She stood in front of his desk, outlining the details of her planned documentary on slayers. Giles cut her off, mid-pontification. "Ms. Lance, given your track record, I'm reluctant to let you anywhere near the Council and its slayers." "Mr. Chairman, I assure you," she assured him with a serpentine smile. "My smear-campaign days are over. My documentary on slayers will be the epitome of balanced journalism." Giles leaned back in his chair, unconvinced. "Face it, Councilor. You need me. Despite the current pro-slayer sentiments, the Council needs all the good PR it can get." She sat down the chair opposite his desk. "Look, all I want to do is accompany some of your girls on a mission, get a sense of who they are and what they do. That's it." Giles considered it while Lance waited patiently. With a sigh, he leaned forward, resting his elbows on the desk. "Very well, Ms. Lance," he reluctantly agreed. "There's a team setting out later this morning on a special mission. I believe it may be just what you're looking for." "Excellent!" she replied emphatically, standing and shaking the hand that he never offered to her. He rose from his seat and walked her out. "This special mission…it wouldn't happen to have anything to do with the miraculous survival of a well-known physicist at the most magical place on earth, would it?" she ventured when they reached the door. Giles looked surprised. "How do you know about that? The press release hasn't even been –"
"That's my job, Mr. Chairman," she replied with a satisfied grin as she left the office. After quickly closing the door behind her, Giles shook his head, a worried expression on his face. Outside the transport ship, the mission team was finishing up the tedious process of packing metal crates and loading them into the cargo bay. As slayers came and went, Jocasta was sorting the items going into her own bag. After dropping off a crate, Katherine stopped by Jocasta. "I can't believe we're going to Disney World," Katherine mused. "I know. I haven't been since I was a child. I just loved the Magic Kingdom. The new one, of course." Jocasta smiled nostalgically as Livia, Janet, and Brianna joined them. "Yeah, well…the old one ain't too magical at the moment," Livia said. "Not with a nest of nasties living in it." Jocasta didn't seem to hear her. "The parade, the treehouse, the teacups…" She sighed happily and began to sing, "It's a small world after all. It's a small world after all…"
Katherine smiled fondly at Jocasta as Livia rolled her eyes. The commander's gaze drifted over to Lisa Lance and her cameraman, who were busy stowing their own gear into two heavy crates. Livia scowled at the reporter. "So, what's the sitch on this 'infestation' we've got to clean out?" Mira asked as she too joined the group. She took her usual place next to Livia, who glanced at her briefly before taking a small step away, which went unnoticed by the others. "Well, as you know," Jocasta explained, "the old Magic Kingdom was closed once the new park debuted. It re-opened some time later as a museum. Sort of a side-tour that visitors could go on if they wanted to see how things used to be in the old days." "The old days," Katherine snickered. "The museum didn't get a lot of traffic," Jocasta continued. "Visiting a park that's sitting right on top of a hellmouth can dull anyone's enthusiasm," Brianna commented. "No kidding," Jocasta said. "At any rate, a few months ago, one of the museum workers was attacked by some demons. Disney hushed it up, set up an electrified fence around the park, and then sent in its own team to clean out the place. It seemed to be only a small nest, so once they dealt with it, they felt like the problem had been solved." "Which is why they allowed Dr. Burkle and her research team to set up camp there," Katherine added. "So who's this Dr. Burkle anyway? I had never even heard of her before the whole shindig at the Anomalous Zone," Janet asked. "Only the top dimensional physicist in the world," Jocasta answered, literally glowing with intellectual zeal. "I mean, have you read her Portals in a Post-Quantum World? It's…it's ground-breaking in its re-examination of quantum mechanics and –"
"Back to the story, sweetie," Katherine gently reminded her girlfriend. "Oh. Right. Anyway, Dr. Burkle and her research team moved in for a three-month study of the hellmouth. For the first couple of days, they worked on setting up their pods, getting their equipment installed, and then…disaster." "Oh yeah," Jocasta confirmed ruefully. "Somehow a major demon infestation set in. The demons attacked and killed everyone but Dr. Burkle. She was able to survive long enough to get to a radio and call for help." Livia scoffed. "I don't buy it." "What do you mean?" Katherine asked. "Number one nerd in the physics world, whose most dangerous exploit to this point has been breaking a nail on a flux spectrometer – she's the only one to escape from a horde of demons, somehow miraculously surviving while her comrades were sliced and diced?" Livia shook her head. "It doesn't track." "You're such a cynic," Mira teased, but Livia didn't smile. Mira frowned slightly, as if wondering what was up. Then she turned back to Jocasta. "After rescuing Dr. Burkle, Disney set up a perimeter shield and called the Council," Jocasta went on. "They're delaying making a public announcement until we get there. They want to be able to say that they've got the best on the job, and that would be you." Jocasta gestured grandly at the slayers. "Is Dr. Burkle coming along?" Janet asked. "I don't know," Jocasta answered. "She's in Giles's office now, probably trying to get permission to accompany us." Jocasta turned to Katherine, her face lit up with excitement. "Wouldn't that be awesome if she could come along?" Jocasta looked away, her eyes dreamy. "I'd love to talk her about her transitional particle theory and how it totally explains the fluctuations in most portals' energy signatures…"
While Jocasta babbled, Katherine glanced Brianna, who smiled and leaned over. "You might wanna watch out for Burkle," Brianna whispered. "Looks like you might just lose your girl to the mad scientist." Katherine chuckled. The remarkably unscathed Dr. Burkle sat in a chair across from Giles and Veronica, relating the story of her escape from the old Magic Kingdom. The physicist shifted a bit in her seat as she spoke, pausing every once and a while to glance up at her listeners. Veronica's eyes locked on Burkle sympathetically while Giles merely watched objectively. When Dr. Burkle had finished, Giles leaned forward. "Dr. Burkle, I know this is difficult," Giles told her, "but we need to know what the slayers should be expecting, anything that might not be in your official report." "Mr. Chairman, it is very important for the girls to be as cautious as possible," Burkle replied. "I saw several different species of demons in the attack, some of which are not even from the same dimension. I myself am lucky to be alive," she added pensively. "Thank you," Giles said. "I'll be sure to pass on this information to the mission commander." "Of course, the team would better benefit from my knowledge if I were allowed to accompany them to –"
Veronica cut the professor off with a lifted hand. "We understand your situation, Doctor," she said, "but it simply isn't safe to allow you back into the park until the threat has been eliminated." "I can take care of myself," Burkle answered coolly, her meek demeanor suddenly absent. "And my work is very important to me." "So it would seem," Giles said. "Nevertheless, there will be no civilians until the mission team gives the all-clear." Burkle sighed but nodded stoically. "Very well." Police tape roped off a vacant lot at the end of a quiet suburban neighborhood south of Cleveland. 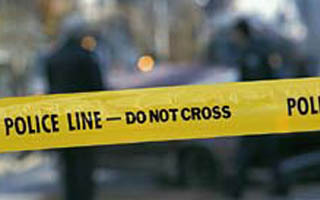 As a team of officers held off the curious inhabitants, a pair of detectives slipped under the tape and walked a short distance away. An officer stood watch over a small mound covered with a tarp. When the detectives arrived, he lifted the tarp. "Ah, damn it," one detective said as he bent down to get a closer look. Then he hung his head and ran his hand along the back of his neck. "Is it – ?" the officer asked. "Yep," said the other detective grimly. "Looks like we got another one."